On the new Pentax K5, this lens has a superb performance, achieving 15 points on the DxOMark score. Looking further, the DxOMark map remains green for almost all apertures up until f8. This indicates that coupled with a Pentax K5, it will produce excellent image quality on even the most difficult conditions. Distorsion, vignetting and chromatic aberration are very well controlled. On the other hand, the resolution, especially at the center (see the comparison below) is not as good as we had expected. 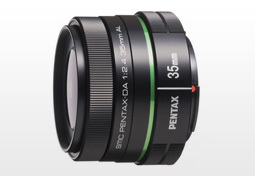 The Pentax 35mm f2.4 Al is a good choice for every photographer and also a good value for money. Let’s see how this lens mounted on the Pentax K5 performs in comparison with its main competitor: the Nikon AF-S DX Nikkor 35mm f/1.8G mounted on Nikon D5000 (please, remember to change the body type). On the DxOMark score the Nikkor 35mm achieves 19 points versus 15 points for the Pentax lens; a gap of 4 points is enough to be noticeable. The gap is easily explained by the wider aperture available on the Nikkor 35mm which will help in low light conditions. On resolution, users will have a choice: those who want homogeneity in the field will prefer the Pentax SMC 35mm f2.4 on the other hand those who care about resolution and detail will probably choose the more resolved lens-body combination of a Nikon AF-S DX Nikkor 35mm f/1.8G on a D5000. Pentax smc 35mm f2.4 AL mounted on Pentax K5 vs Sony 35mm F1.4 G mounted on A350 (please, remember to change the body type). At first sight this comparison may seem unfair due to the nature of these camera bodies; hence we will have to wait for the latest Sony Cameras test (Sony A580, Sony SLT A55 and Sony SLT A33). Pentax smc 35mm f2.4 AL mounted on Pentax K5 vs Carl Zeiss Distagon T 35mm f/2 ZF2 Nikon mounted on Nikon D7000 (please, remember to change the body type). Pentax smc 35mm f2.4 AL mounted on Pentax K20D vs Sigma 30mm F1.4 EX DC HSM Canon mounted on Canon EOS 500D (please, remember to change the body type).